Background: Musculoskeletal disorders are a major problem in all jobs. Several methods are available for assessing the exposure to risk factors associated with musculoskeletal disorders. This study is aimed at comparing three different ergonomic risk assessment methods—rapid upper limb assessment (RULA), loading on the upper body assessment (LUBA), and new ergonomic posture assessment (NERPA) method—to predict upper extremity musculoskeletal disorders. Materials and Methods: The study was conducted on 210 workers from three different industries including pharmaceutical, automotive, and assembly in the Isfahan province. A Nordic questionnaire was used for determining the levels of musculoskeletal disorders. Then, selected postures were evaluated with RULA, LUBA, and NERPA methods. Finally, data were analyzed with Kolmogorov–Smirnov test to check the normality distribution of data, Spearman's correlation test to investigate the correlation between the assessed levels with musculoskeletal disorders, and Wilcoxon test to identify significant differences between the values with SPSS version 16. Results: Wilcoxon test revealed a significant difference between the values related to NERPA and RULA (P < 0.001), whereas no significant relation between LUBA and RULA was shown by this test (P = 0.914). The correlation coefficients of the musculoskeletal disorders' level with RULA level, NERPA level, and LUBA level were 0.74, 0.73, and 0.69, respectively. Conclusion: Low-risk levels in NERPA, medium-risk levels in LUBA, and high-risk levels in RULA are evaluated better. The results showed that RULA was the best method for assessing musculoskeletal disorders among the three methods. The design of workplaces must be based on ergonomic principles taking into account human factors. Not many workstations can meet all the ergonomic principles in their design. Work-related musculoskeletal disorders (WMSDs) are directly related to these non-normative designs. In recent years, WMSDs have come to be regarded as the main cause of occupational injury and disability in industrialized countries, affecting not only individuals but also organizations and society.,, These disorders can prove costly by affecting quality and usefulness. In the United States, 29.00% of all lost working time is attributed to MSDs. In Iran, full statistical information on the subject is not available, but a study showed that 13.10% of the government's budget in 2000 was spent on remedying MSDs. There is a high prevalence of MSDs in developing countries due to lack of effective programs to prevent injuries and eliminate poor working conditions. Considering the importance of MSDs in financial and human terms, these disorders must be prevented through interventions to reduce exposure-associated risk factors. The execution of preventive programs requires prediction and assessment of potentially dangerous situations that cause MSDs, and intervention in such cases can reduce the incidence of MSDs. So the first step in the selection of an appropriate method to assess MSDs is a test of the approach adopted by an industry and a comparison of the results. Several methods are now available for assessing the exposure to risk factors associated with MSDs to identify the potential risks involved in ergonomic jobs. These methods are classified into three groups: subjective assessment (e.g., questionnaires and measurement scales), systematic observation, and direct measurement. Observational methods are still the most commonly used. These methods are simple, low-cost, and more flexible than other methods in field studies. In recent years, the number of published methods for the evaluation of MSDs has significantly increased but few practical studies have examined them in industries to compare them, and there is dearth of information about the methods most appropriate for the prevention of MSDs. Some researchers have studied various methods, their validation, and risk factors. However, few studies have compared the results of these methods. For example, Kee and Karwowski compared the results of the rapid upper limb assessment (RULA), REBA, and OWAS methods in 2007. Chiasson et al. studied and compared the results of the quick exposure check (QEC), rapid upper limb assessment (RULA), rapid entire body assessment (REBA), hand activity level (HAL), job strain index (JSI), occupational repetitive actions (OCRA), and EN 1005-3 standard within a 4-year period. But there are few studies that focus on risk assessment methods. Given that loading on the upper body assessment (LUBA) and new ergonomic posture assessment (NERPA) methods are modified forms of RULA method to evaluate ergonomic risks to the upper limb, and as there is no similar study on this subject, this study aimed to compare three different ergonomic risk assessment methods such as RULA, LUBA, and NERPA for predicting upper extremity MSDs to identify the best method for assessing different postures. The MSDs of 400 male workers in three industries—pharmaceutical, automotive, and assembly—of the Isfahan province were evaluated using a Nordic questionnaire [Nordic Musculoskeletal Questionnaire (NMQ)] in the summer of 2016. The staff of the industries spoke about individual musculoskeletal discomforts. With the help of Nordic questionnaire, the period of prevalence (past 12 months), the incidence point (7 days), and the severity of musculoskeletal problems (e.g., pain, discomfort, numbness or tingling) of the person were enquired about and MSDs identified. Based on the results of questionnaires and interviews, people with a history of occupational and non-occupational illnesses or accidents affecting the musculoskeletal system and those with mobility problems such as arthritis and herniated disc with non-occupational causes were excluded. In addition, because the aim of this study was posture assessment, the subjects with tasks that their force is more than 5 kg were excluded. In the next step, based on data from Nordic questionnaire and observation of job status to investigate the proportion of MSDs to occupation, the subjects were divided into low, medium, and high MSD categories. In the end, 210 subjects were selected for further studies; of them, 70 subjects had low MSDs, 70 had medium MSDs, and 70 had high MSDs. In all 75 subjects were selected from pharmaceutical factory, 87 from automotive industry, and 48 from assembly industry. Each of the 210 individuals was performing only one task and the individuals had different workstations and postures for performing their tasks. The individuals had low, medium, and high MSDs caused by working on these tasks. After selection and observation of these tasks by experts, videos and photographs were taken and the duty cycle of each person was carefully recorded. In the next step, pictures of the worst and most frequent physical postures among the various postures each individual adopted while executing each task were extracted from the photos and videos. In the selected posture, some areas of the body, such as the neck, trunk, waist, and legs, had long-term static activity and some parts, such as hands and arms, had long-term static activity or repetitive movements. Besides, the forces in the selected postures were often between 0 and 5 kg. Based on the criteria of the Roman–Liu study, the three methods of RULA, LUBA, and NERPA were identified to properly assess the risk of MSDs associated with these postures. Finally, all the pictures were evaluated by all the three methods, RULA, LUBA, and NERPA. Each of these three methods classified the risk of MSDs into four levels. A brief overview of ergonomic risk assessment methods used in this study is given below. RULA method, which was presented in 1993, assesses static muscle activity and the force exerted on the upper limbs. This method is designed to quickly evaluate the load on the musculoskeletal system due to postures of the neck, waist, and upper limb; muscle function; and the additional burden imposed on the body. RULA shows a final number as the snapshot of a task representing the degree of posture, force, and motion. Based on RULA final score, four action levels are proposed, showing the level of required intervention to reduce the risk of injuries caused by physical load on individuals. The RULA method can be considered to be an evolved form of ovako working posture analysis system (OWAS) method used for a closer examination of the upper limb. NERPA: It was presented for the first time in 2013 as one of the last working posture assessment methods, which does a better assessment of the physical condition. In fact, NERPA is a modified version of RULA and has the same structure; however, NERPA had major changes than RULA. This method is similar to many observational posture assessment methods that use a form of scoring system based on individual physical conditions for reporting the final score; and, finally, based on posture score, this method determines four action levels. Action levels in this method are similar to RULA. LUBA: This method is an observational and macro-postural technique, which was presented by Kee and Karwowski in 2001, and its purpose is to evaluate the pressures of the upper limb posture. This method is based on empirical data compared with perceived discomfort and expressed as a numerical ratio for a set of five detailed movements of the body, including those of the wrists, elbows, shoulders, neck, and waist. The feeling of discomfort is measured for each joint at five levels including 0%, 25%, 50%, 75%, and 100% of the range of joint motion. In the selected postures, the movements of each joint are observed and, based on the related tables, discomfort points are assigned to them. Finally, the ratings of all the joints are added and the postural load is determined. The score of postural load is indicative of action levels from 1 to 4. The collected information of MSDs and the risk assessment methods, including the risk levels for each posture, were entered into SPSS version 16 for the next analysis. At first, the descriptive analysis was performed. Finally, the data were analyzed with Kolmogorov–Smirnov test for checking the normality distribution of data, Spearman's correlation test for investigating the correlation between the assessed levels with MSD levels, and Wilcoxon test for investigating the significant differences between the values. The mean and standard deviation of age were 38.60 and 5.90, respectively. The data were obtained from the three methods—RULA, LUBA, and NERPA—in general, and three levels of disorders (light, moderate, and high) as shown in [Figure 1] and [Figure 2], respectively. In these figures, the colors indicate the action levels: the green, yellow, orange, and red colors show action levels 1, 2, 3, and 4, respectively, in the three methods. The results of Kolmogorov–Smirnov test showed that the distribution of data was not normal. Spearman's test was used to investigate the correlation between the assessed levels with MSDs, the results of which are presented in [Table 1]. Based on Wilcoxon test, it was also found that there was a significant difference between the values related to NERPA and RULA (P< 0.001), whereas there was no significant relation between LUBA and RULA which was revealed by this test (P = 0.914). [Figure 3] shows the values of risk levels related to the three risk assessment methods (RULA, LUBA, and NERPA), based on industry type. Spearman's test was used to investigate the correlation between the assessed levels with MSDs in pharmaceutical industry, automobile manufacturing unit, and assembly plant, the results of which are presented in [Table 2]. Moreover, the results of Wilcoxon test showed that the levels of NERPA, compared to the levels of RULA, were significantly different in pharmaceutical industry, automobile manufacturing unit, and assembly plant (P< 0.002), whereas the results showed that the levels of LUBA, compared to the levels of RULA, were not significantly different in pharmaceutical industry, automobile manufacturing unit, and assembly plant (P > 0.364). This study aimed to compare the levels of the actual MSDs (through a Nordic questionnaire) with the levels of predicted MSDs (by RULA, LUBA, and NERPA). The results have generally shown that NERPA method identifies low-risk level of the actual MSDs better than the other two methods, whereas LUBA method recognizes medium-risk level of the actual MSDs better than the other two methods, and RULA method identifies high-risk level of the actual MSDs better than the other two methods. In fact, the results show that none of the three methods—RULA, LUBA, and NERPA—is comprehensive enough to predict all the three levels of MSDs. There are some studies that show RULA method overestimates the ergonomic risk of low-level MSDs. For example, Kee and Karwowski conducted a study in 2007 that compared three ergonomic risk assessment methods including RULA, REBA, and OWAS, and the results showed that RULA assessed 56.00% of the people studied to be in the medium- or high-risk levels, whereas OWAS and REBA assessed 79.00% of the jobs to be in the low- and very-low risk levels. Sanchez-Lite et al. did a study to develop a new ergonomics evaluation method, NERPA, in 2013, the results of which showed that both RULA and NERPA methods could detect high-risk postures but RULA was not capable of showing tasks without risk, whereas NERPA showed that 16.30% of operations are without risk for damage. Moreover, in a study by Chiasson et al. in 2012, eight methods—QEC, FIOH, RULA, REBA, HAL, JSI, OCRA, and EN 1005-3 standard—were compared to assess MSDs. The results showed that RULA could not identify any low risk and showed 76.00% of workstations to be in the high-risk level and others in the medium-risk level. These findings are consistent with the results of this study. This is perhaps due to the fact that in RULA method, there are few divisions for assigning the body angles. Besides, in this method, the angles of flexion, more than the angles of extension and other situations, are considered. In NERPA method, only the angles of RULA method have been modified, but disadvantages such as lack of divisions for giving scores to angles and low attention accorded to angles of extension and other situations have not been resolved. This correction of angles has led to a better recognition of low risks of MSDs but an underestimation of high risks. A study by Haghshenas, done in 2016, also shows that in evaluating the risk of MSDs in an industrial company, 51.72% risks were identified a high by QEC method, whereas only 33.33% of the risks were recognized to be high by NERPA method. In LUBA method, more divisions for the scoring of the angles in all directions such as extension, flexion, lateral deviation, and rotation have been considered, and this method performs a posture assessment more accurately. However, in this method, as the factor of movement frequency is not considered, high-risk tasks are not well-identified. The results of a study by Mohammadfam et al., in 2010 in an industrial company, also shows that 71.30% of the risks are identified to be high by QEC method, whereas only 24.25% of risks were evaluated as high by LUPA method. Therefore, it is suggested that due to proper scoring of the body angles in LUBA method, the addition of factors such as force and movement frequency and other ergonomic factors could lead to the development of a novel method. Although LUBA and NERPA methods are designed and developed to overcome the disadvantages of RULA method, the results of this study show that LUBA assessment levels had no significant difference with those of RULA. Moreover, in a study by Sahu and Sett in 2010, which used LUBA and RULA methods to assess MSDs among female workers in a manual brick industry, the results showed that the assessed levels of LUBA were very close to those of RULA, whereas LUBA also had a problem in evaluating low MSDs. 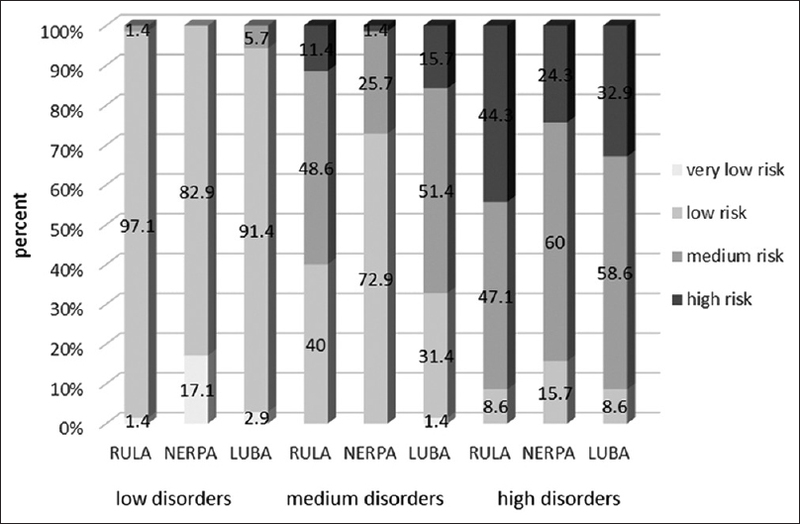 Thus, the results show that LUBA evaluation method has not been improved when compared with RULA method, whereas the results of this study show that NERPA assessment levels were significantly different from those of RULA, and that the NERPA assessment levels had highest correlation with RULA. This indicates that intervention with RULA method has been effective, and NERPA acts as an independent method to assess the risk of MSDs. Khandan did a study on validation of NERPA in Iran in 2015 and the results showed an acceptable correlation between RULA and NERPA, and there was a significant difference between the levels of risk assessment in the two methods. However, the results of this study generally show that RULA method, among the three methods, is the most appropriate one for the assessment of MSDs, as RULA risk assessment levels have maximum correlation with MSDs, instead of the other two methods. In addition, when the analysis was carried out separately in each industry, the results showed that RULA method, among the three methods, is the most appropriate one for the assessment of MSDs in the pharmacy and assembly industries, whereas NERPA method, among the three methods, is the most appropriate one for the assessment of MSDs in the automobile manufacturing industry. Of course, in the automobile manufacturing industry, correlation coefficient between RULA risk assessment levels and MSDs (correlation coefficient = 0.750) was very close to correlation coefficient of NERPA risk assessment levels and MSDs (correlation coefficient = 0.753). This shows that the change in angles in NERPA and LUBA methods has not overcome to the disadvantages of RULA method. Therefore, the development of a new method, based on the combination of three methods including RULA, LUBA, and NERPA, is required. The results also show that similar results were obtained when the analysis was done separately for each industry. The limitation of the study was the lack of investigation of tasks applying to high force. It is suggested that methods for these tasks are also compared in future studies. The results generally showed that low-risk, medium-risk, and high-risk levels are better identified by NERPA, LUBA, and RULA, respectively. Therefore, considering the importance of risk identification before the appearance of MSDs, it is proposed that a new method, based on the combination of the three methods including RULA, LUBA, and NERPA, is developed. The results also showed that RULA is the best method for the assessment of MSDs among all the three methods—RULA, NERPA, and LUBA. The authors appreciate the participants in this study. This study was supported by authors. Chiasson M-È, Imbeau D, Aubry K, Delisle A. Comparing the results of eight methods used to evaluate risk factors associated with musculoskeletal disorders. Int J Ind Ergon 2012;42:478-88. Choobineh A, Tabatabaei SH, Mokhtarzadeh A, Salehi M. Musculoskeletal problems among workers of an Iranian rubber factory. J Occup Health 2007;49:418-23. Buckle PW, Devereux JJ. The nature of work-related neck and upper limb musculoskeletal disorders. Appl Ergon 2002;33:207-17.
WHO Scientific Group on the Burden of Musculoskeletal Conditions at the Start of the New Millennium. The burden of musculoskeletal conditions at the start of the new millennium. World Health Organ Tech Rep Ser 2003;3:112-9. Pascual SA, Naqvi S. An investigation of ergonomics analysis tools used in industry in the identification of work-related musculoskeletal disorders. Int J Occup Saf Ergon 2008;14:237-45. Nouri J, Azadeh A, Fam IM. The evaluation of safety behaviors in a gas treatment company in Iran. J Loss Prev Process Ind 2008;21:319-25. Jafry T, O'Neill DH. The application of ergonomics in rural development: A review. Appl Ergon 2000;31:263-8. Van Rijn RM, Huisstede BM, Koes BW, Burdorf A. Associations between work-related factors and specific disorders of the shoulder—A systematic review of the literature. Scand J Work Environ Health 2010;3:189-201. Takala E-P, Pehkonen I, Forsman M, Hansson GA, Mathiassen SE, Neumann WP, et al. Systematic evaluation of observational methods assessing biomechanical exposures at work. Scand J Work Environ Health 2010;1:3-24. Kee D, Karwowski W. A comparison of three observational techniques for assessing postural loads in industry. Int J Occup Saf Ergon 2007;13:3-14. Roman-Liu D. Comparison of concepts in easy-to-use methods for MSD risk assessment. Appl Ergon 2014;45:420-7. McAtamney L, Corlett EN. RULA: A survey method for the investigation of work-related upper limb disorders. Appl Ergon 1993;24:91-9. Sanchez-Lite A, Garcia M, Domingo R, Angel Sebastian M. Novel ergonomic postural assessment method (NERPA) using product-process computer aided engineering for ergonomic workplace design. PLoS ONE 2013;8:e72703. Khandan M, Vosoughi S, Poursadeghiyan M, Azizi F, Ahounbar E, Koohpaei A. Ergonomic Assessment of Posture Risk Factors Among Iranian Workers: An Alternative to Conventional Methods. Iranian Rehabil J 2018;16:11-6. Kee D, Karwowski W. LUBA: An assessment technique for postural loading on the upper body based on joint motion discomfort and maximum holding time. Appl Ergon 2001;32:357-66. Haghshenas B. Risk of musculoskeletal disorders in a manufacturing company using NERPA and QEC methods. J Prev Med 2017;3:75-67. David G. Ergonomic methods for assessing exposure to risk factors for work-related musculoskeletal disorders. Occup Med 2005;55:190-9. Mohammadfam I, Kianfar A, Afsartala B. Assessment of musculoskeletal disorders in a manufacturing company using QEC and LUBAmethods and comparison of results. Iran Occup Health 2010;7:7-10. Sahu S, Sett M. Ergonomic evaluation of tasks performed by female workers in the unorganized sectors of the manual brick manufacturing units in India J Ergon Soc South Afr 2010;22:2-16.